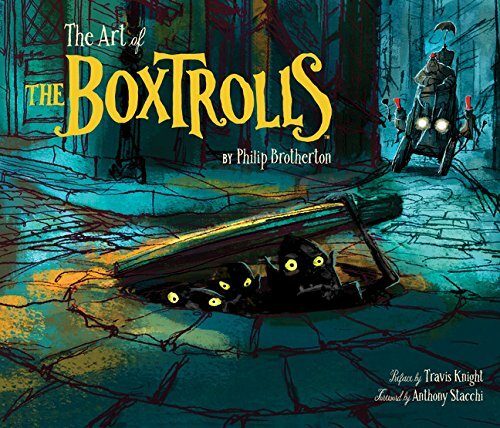 The Art of The Boxtrolls is a pleasing companion artbook to Laika's third stop-motion film. There are plenty of pre-production art for the characters, sets and a substantial amount of text talking about the film making process. The film is actually adapted from Alan Snow's Here Be Monsters! children book. For those who've read the book before, you might find it a bit more interesting to see how the characters are designed and made into stop-motion characters. Michel Breton's design of old Europe and the houses on the sloping streets of Cheesebridge are delightful to look at. Art direction is driven by production designer Paul Lasaine and art director Curt Enderle. Those who enjoy finding out how stop-motion films are made should find the text quite insightful. It takes about the challenges during production, such as creating the puppets, armature, costumes and the sets. There are many details that a director has to take note of and the book reveals a bit of those. Designers also talk about the little details such as props that don't draw attention to themselves. I had thought everything in the film was physically made but in fact several sets such as the buildings in the background are actually computer generated. My only gripe is there should have been more photos of the puppets because they look terrific. Readers expecting more behind-the-scenes photos would be disappointed but I feel the plethora of concept art do make up for it. This is a 160-page hardcover. Ultimately, it's a satisfactory companion and a book I can recommend to fans of the film.